The farm receives visitors from 10 to 15, seven days a week, 365 days a year. The later you come, the less you see. If you are not a member of an organized excursion group from a tourism bureau, you can join an organized group or buy a guided tour here. To join a group, an adult single person should pay 150 roubles; a child older than 4 years, a student, invalid or pensioner – 100 roubles; a child under 4 years goes free of charge. 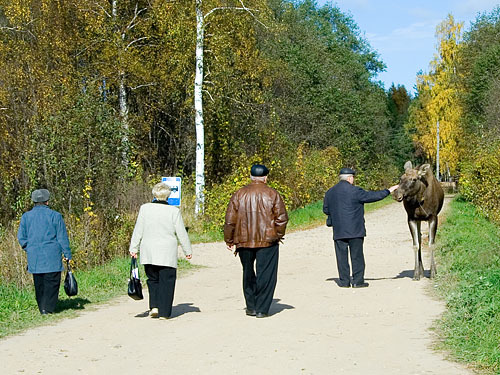 A minimal pay for a tour is 300 roubles (for 1 or 2 people). You should book an excursion in advance only if you are a head of an organized group coming by bus or if you are not satisfied with a «standard tour», i.e. 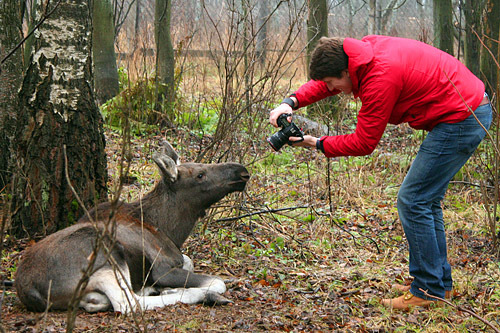 you want, for example, to make a professional video of a calf birth or moose cow milking. Call (+7 4942) 35 94 33, +7 903 895 40 48 (the accountant-general and booking tours in advance), +7 910 958 01 67 (the director). They speak only Russian. See details on the next page. Warning! Please don't walk around fences without a guide, because moose are everywhere, both inside and outside enclosures. 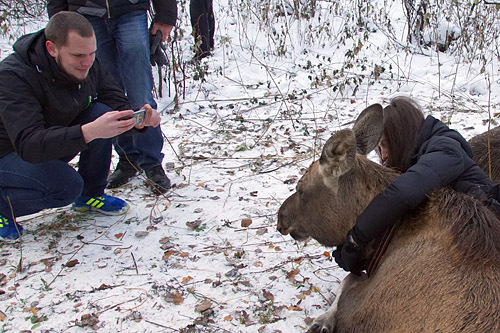 In winter visitors look at moose from inside an enclosure, but they can meet animals on the road. If you are not familiar with moose behavior and perception, you can unintentionally imitate a predator and cause a defensive action. Please read safety regulations in the bottom of this page. 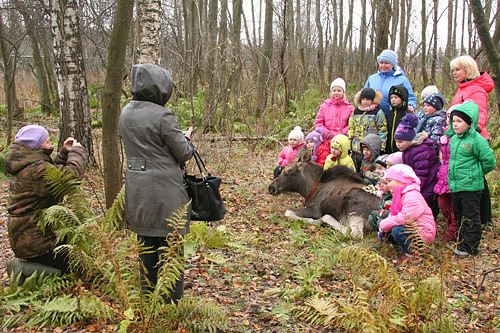 During a standard guided tour you will see moose of various ages through fences (Rabitz or rail), take photo and video. 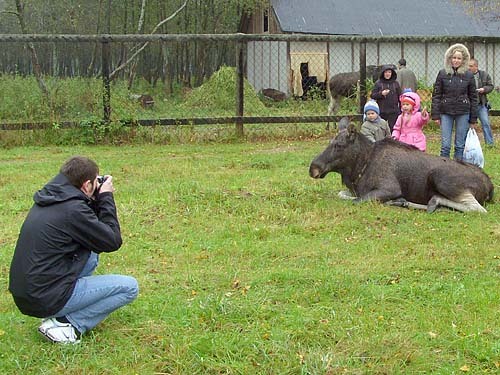 You may use a camera with flash, because moose are unresponsive to it. 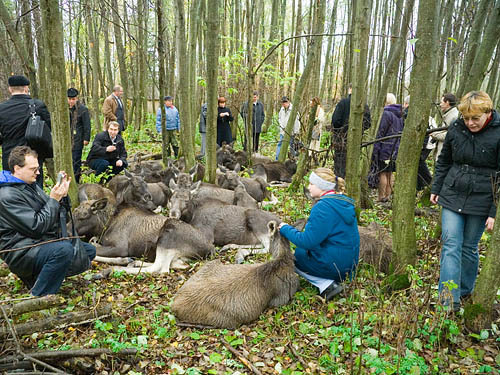 You will hear a guide's narration about moose farming. All the rest depends on a season, an occasion, and your luck. The guide will take a pack of clean cut carrot for you to entertain adult animals. Moose like carrot, and usually wait for you to feed them. Don't feed calves. Don't regale moose with your own bread, carrot, apples, tarts, etc. No pets! No laser pointers! No UV torches! As a rule, a standard trip duration is about an hour or longer depending on your interest and number of questions asked. Buying souvenirs and, possibly, a travel on feet to calves summer camp may take an additional time. 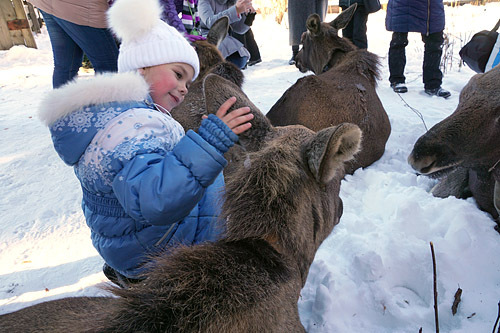 In the first years after ballistic missiles were withdrawn from the Sumarokovo reserve, rocket silos exploded and the excursions ban was lifted, visitors could contact almost every animal inside enclosures. 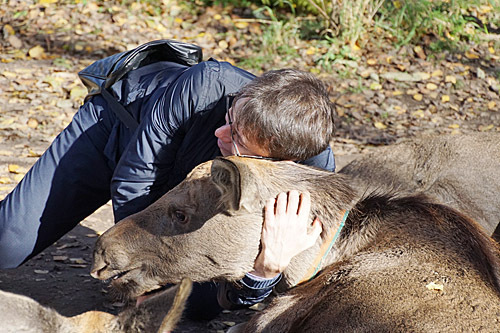 It was possible to feed moose with bread, sweets and tarts, scratch necks and embrace them, take a photograph of a person together with a moose for remembrance. The tour included a visit to milking house and dark sheds, visitors could see calves sucking milk from baby-bottles. Visitors couldn't see milking because moose cows were nervous of children scream and milk yield dropped down. Visitors could not feed calves with sweets and kiss them because of the risk of gastrointestinal diseases and other infection. You can only see that good period in my film (DVD) which is sold in the «bar» near the farm. As the stream of guests increases, the safety arrangements and sanitary rules are excessively stiffening. Sorry, I cannot predict tomorrow inhibition and bans. I only describe the excursions in the latest years. Immediate contacts are possible now only with calves, and only July to December. Twisted steel wire fabric (Rabitz) fences built instead of rail ones obstruct touching the animals. 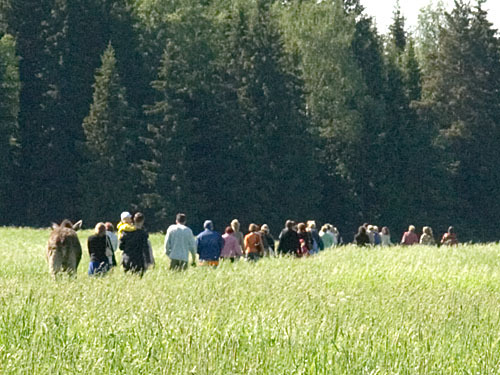 The content of a standard guided tour depends on a season. 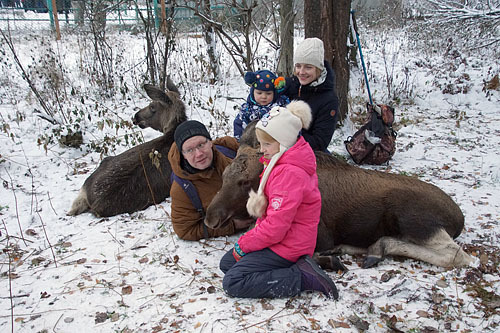 In winter all moose live near a wood felling place (see pages above), and a group of tourists is usually placed in an enclosure near feeding troughs and branch piles. 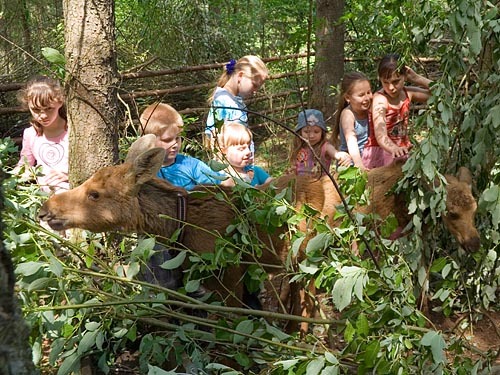 Moose are free, while human appear in a zoo cage. 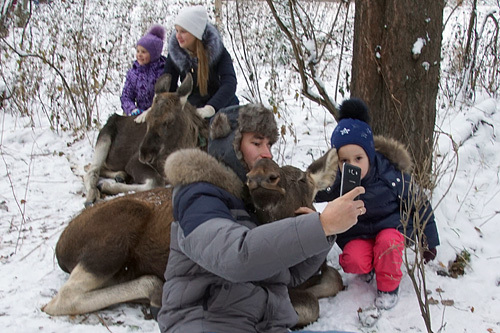 To attract animals, tourists use carrot. 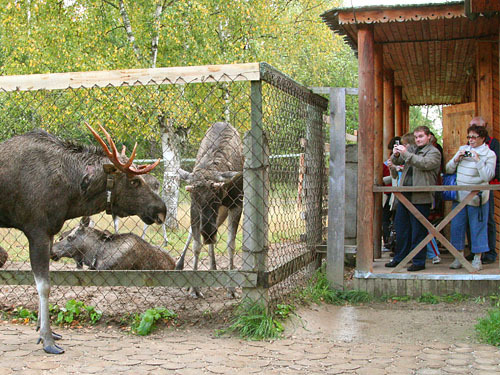 People can interact with moose only through a fence. 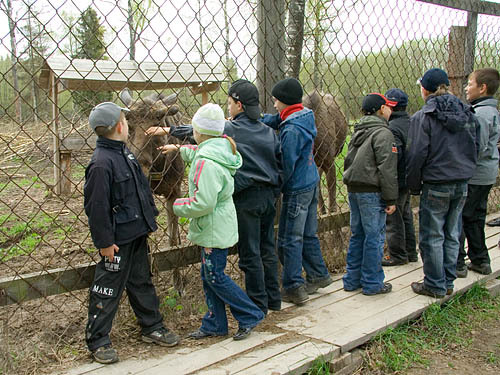 In April all animals dwell in two enclosures, and visitors move along wire fences. 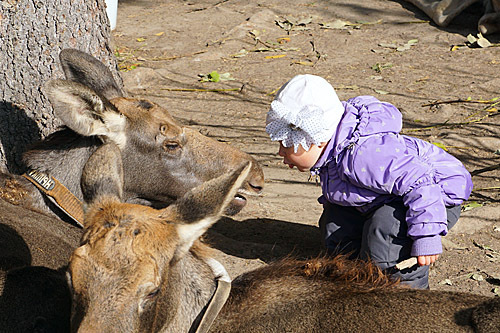 No chance to meet a free moose and touch an animal without a fence. This is the most unexciting period for visitors. The road is dirty and goffered. In the end of April or early May a trip becomes more interesting because first calves are born. During the May holidays the farm is crowded with visitors. In April, May and early June visitors can behold calves only over a fence. 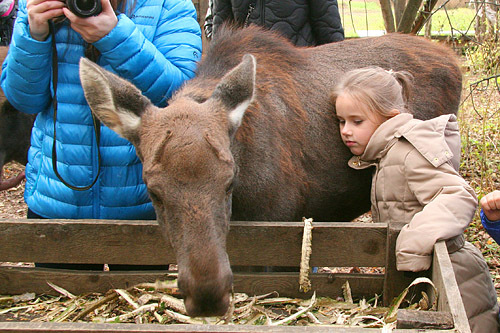 Though young animals can be seen only through fences, tourists have a chance to meet a milk-moose released from a maternity enclosure 2-4 days after parturition. May to October they come for milking every morning and then return to their forest pastures, sometimes along fences and through car parking. 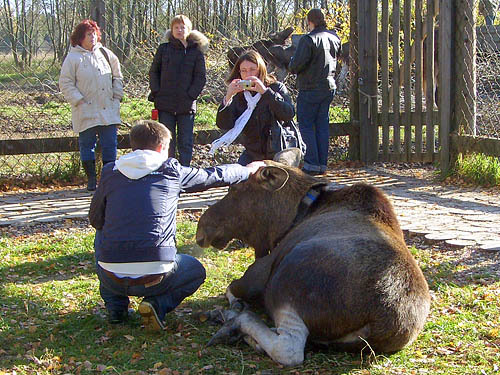 Around the farm, up to 4 km apart from its enclosures, people can suddenly meet a browsing moose with a collar. Don't panic, that's normal. 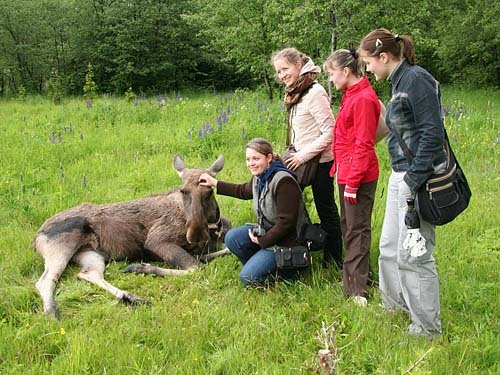 Nevertheless, don't anticipate that you'll touch a free moose during a short trip. Sometimes it takes hours to find a radio tagged animal in the natural environment by means of a radio direction finding receiver. 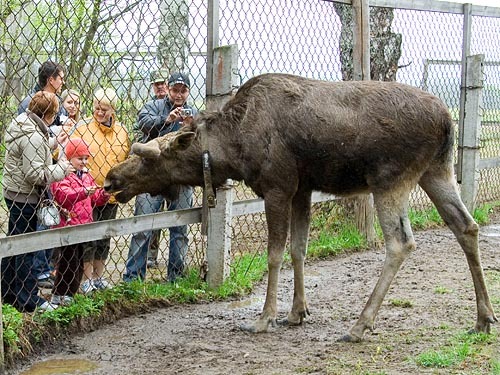 On the other hand, a considerable part of visitors prefer to «communicate» with big animals through steel wire fences, though a full enjoyment in excursion will get only those who happen to feel a moose warmth. 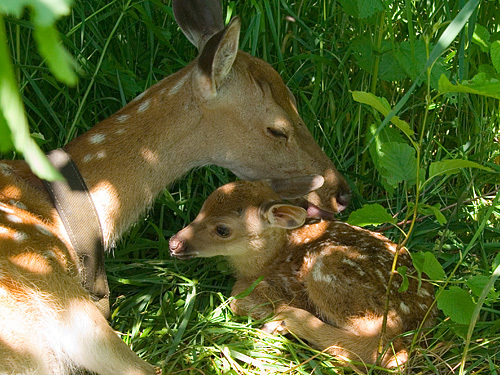 In mid-June newborn calves begin their free life in a summer camp near the Poksha River. They are confined in a fence only for several hours, 10 to 15 o'clock, i.e. during the excursion period. Then all gates are open, but calves may stay in shade until gad-flies disappear. Visitors are allowed to enter the enclosure, take photo and video. 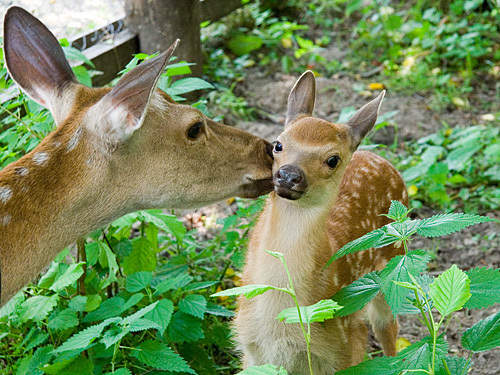 From July-August visitors can also pat a calf, kiss his nose, squeeze him, scratch his neck, and lay down near him. Visitors are NOT allowed to feed calves! Don't chase those who don't want to communicate. Children establish friendship easily. The more contacts between people and calves, the more communicable and good-nature the calves will be when they grow up. I hope human will also become a little bit better. 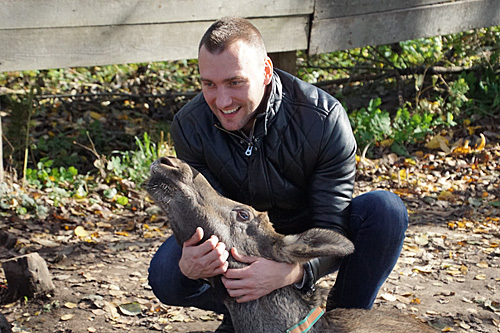 I advise to touch an animal and try to feel his warmth. Vasily Kozhurin, Dr. Vet. 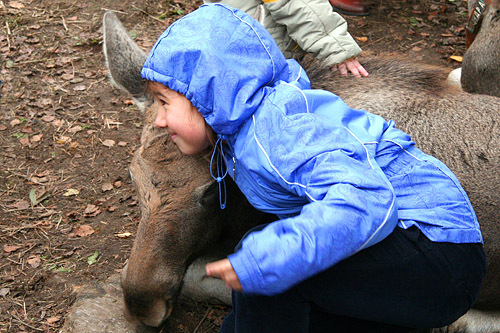 Sci., who studied micro-nutrients on the farm, emphasized that «...near a moose all become like children. 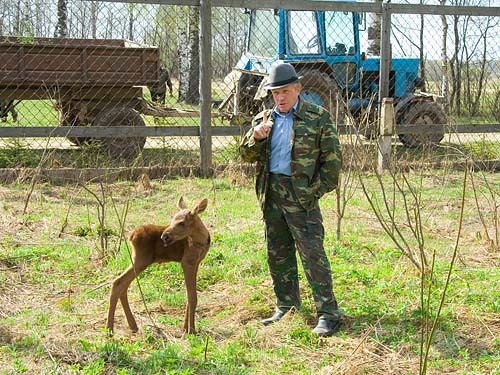 I saw foreign frowning men who had a look of kindness about their faces and changed completely while seeing moose calves...» He is sure: the one, who made acquaintance with a moose in childhood, will not be able to kill a moose later (http://www.smena.ru/arc/22770-log.html). After contacts with calves, tourists return to the «arc and bar». Look at the top right photo: Limpa likes to join a group of tourists on their way to the summer camp. 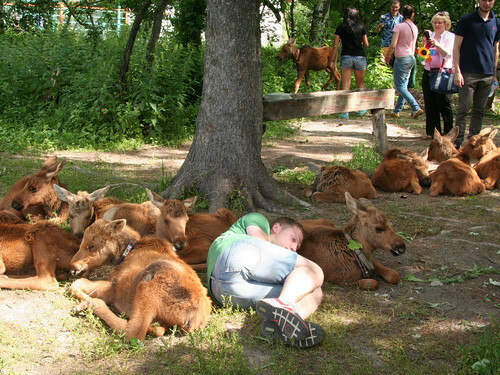 In the morning you have more chance to meet a free moose. Some tourist groups meet them immediately on the parking. If you are not scared, you may pat them and take a photo, but never chase those who try to escape. Watch their ears: some animals don't like over-familiarity. October to December calves meet visitors in a small enclosure near the bar. 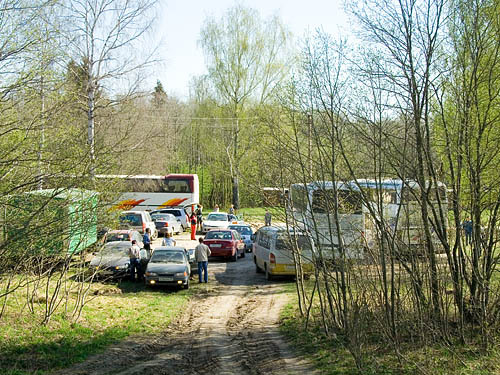 Local roads in Russia are all but impassable in autumn, that's why a summer camp is no more usable. Now the tour route is very short, because all is in one place. Adult moose are still free and come here on occasion, if they want to. A dairy moose called Yaka likes to lay near the arc. The visitors, who dare to come closer can take a photo. Once a student girl asked if we «pumped» Yaka with tranquilizers. I'd like to answer: you may sit down on her back, but I can't guarantee that you'll not need tranquilizers later. 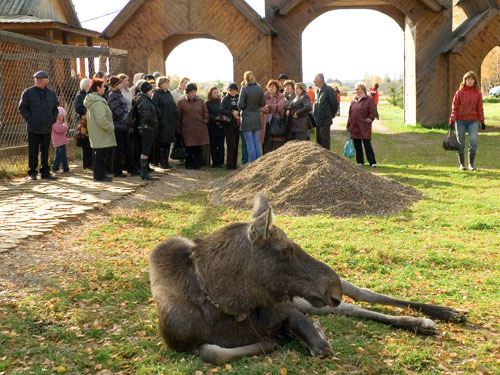 In the recent years farm employee began to prevent contacts between visitors and adult moose, but they can't control everyone. Now they close south and east gates of the cows' enclosure to enforce them go north and west after milking and breakfast. Sometimes this helps, sometimes not. 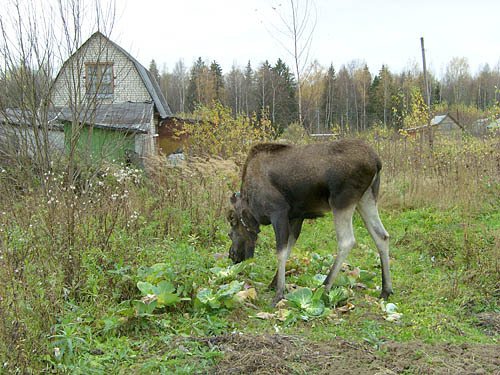 By the way: the best moose tranquilizer is a food abundance. A hungry moose is an angry moose! The food is really abundant in the autumn, and the best and tasty one is growing in cottagers' gardens. If we had no GPS radio tracking, we'd never know that after the end of the last excursion, Yaka leaves the farm for the gardens 3-4 km away from the farm. Every morning she returns to the milking house to eat her bucket of oatmeal, and at 10 o'clock is ready to gladden visitors again. 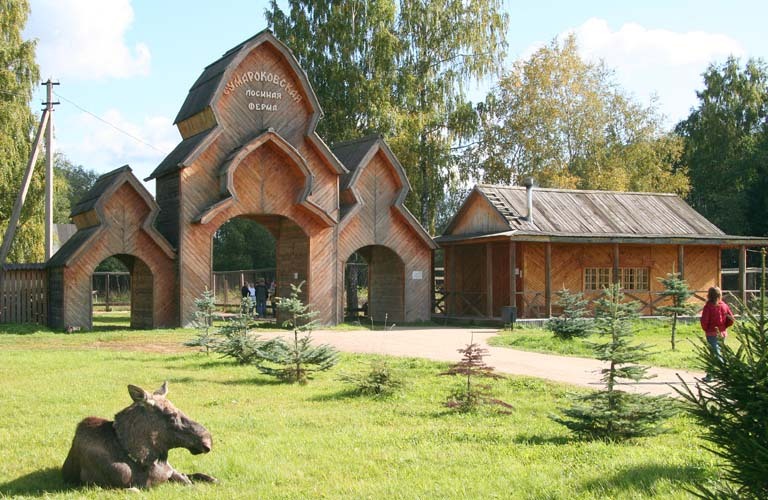 In the recent years, several other moose cows: Nimfeya, Limpa, Limonka and even shy Yakutka joined Yaka and lay down near the «farm entrance». 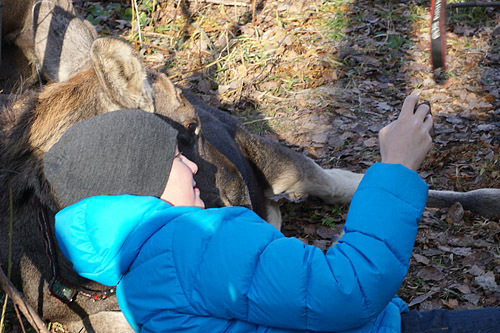 In addition to moose, the farm tried to expose other ungulates: wild boar and Sika deer. Boars were released to avoid contagion. Wild dogs killed both deer. This doe wasn't shy at all. 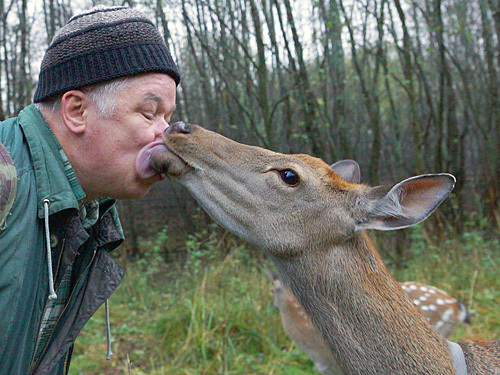 It is common error that deer lick humans because of a salt shortage. They had two salt bricks with mineral additives in this enclosure, but liked to lick visitors and us. (The last photo was taken by Vladimir Gotovtzev). 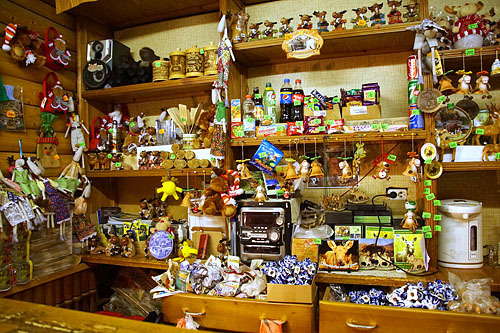 After the excursion visitors may drink a cup of tea in the «bar», taste moose milk (fresh in mid-June to early October or thawed), buy souvenirs and a disk with 1,5-hours film about domestic moose life. The film shows you almost all: from calves' births to machine milking and autumn rut invisible for tourists. If you want more than the standard tour, you can try to become useful for the farm and animals. Some enthusiasts lived in a tent in the reserve, with farm administration permission. So far neither one tent nor its dweller were damaged by moose, boars, bears, foxes, wild dogs, and transient wolves and lynx. 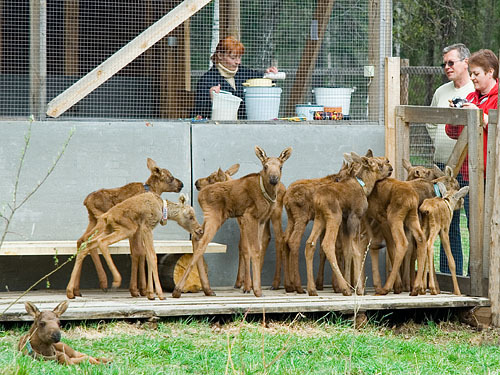 What is not available on the moose farm? 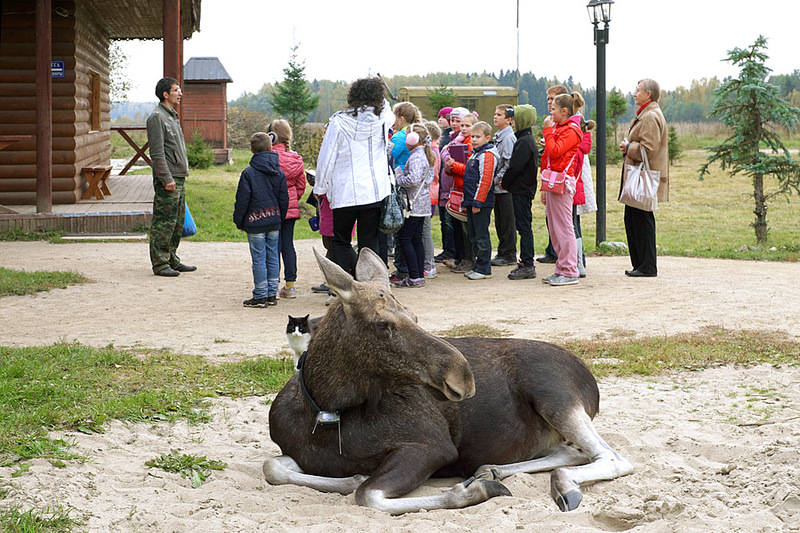 The moose farm has no its own guided bus tours, has no right to send invitations abroad and sell animals abroad. It has no hotel or lodging. Sometimes the farm has got vacancies, but no housing, unfortunately. Walking even along fences outside enclosures and across the farm territory without a guide may be dangerous. In a zoo human is always separated from other animals with fence, bar, ditch, glass, etc. 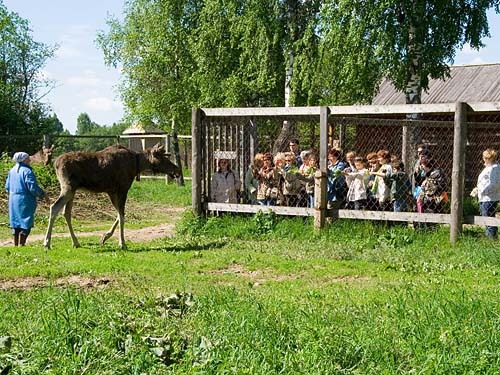 Despite all, unexpected contingency may arise, like this: a call to the zoo administration: – «A bear is playing with our children, may we feed him with ice cream?» Moose farm is not a zoo, and free movement of moose here is not exclusion, but a rule. Moose are unmalicious, kind, pettable animals, but they are strong and sometimes cannot control their strength when playing. Females can defend not only themselves, but also their calves or dairywomen. 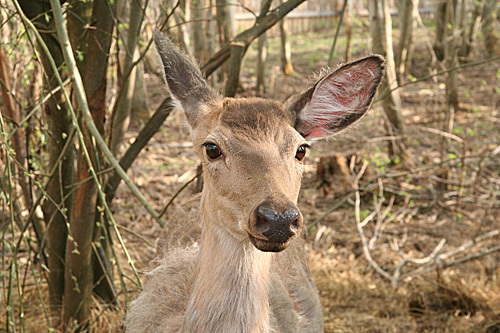 Males go out of their minds during the rut period. 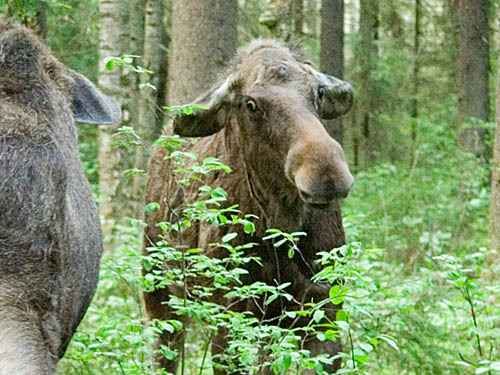 Moose perception differs from human, therefore mutual misapprehension can arise. Your unintended move can cause a defense reaction. A moose cow can strike your head with a hoof if she imagines you attacking her «calf», a dairymaid. 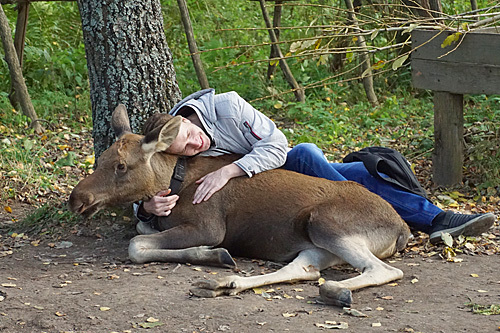 Please prevent this, because your trauma and even complain may cause the worse consequences for moose. The young No-spa was shot for attacking visitors. Yanode forfeit his life for his friskiness. He never stroke anyone but a car of a local militiaman (policeman), he only played with passengers at a bus stop and dairywomen of a local dairy farm (not moose). 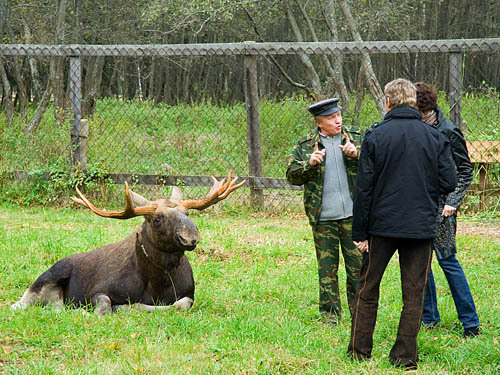 Please remember, observances of the regulations will help you to secure both yourself and moose. 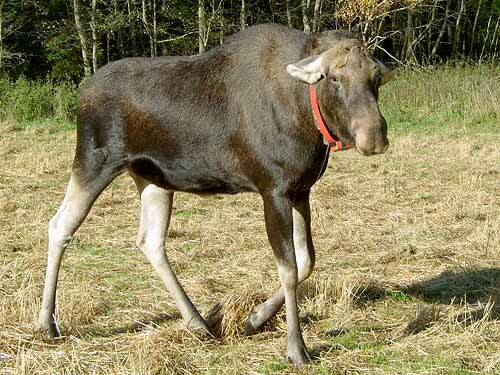 Like many other animals, moose almost never attacks without a preliminary warning. You must know how the warning «looks» like. The essential indicators of threat are: «ears back and down», almost pressed to the neck; raised hair on the scruff of the neck or on whole body, approach along an arc, a straight look. The first photo depicts a conflict between the two mothers. 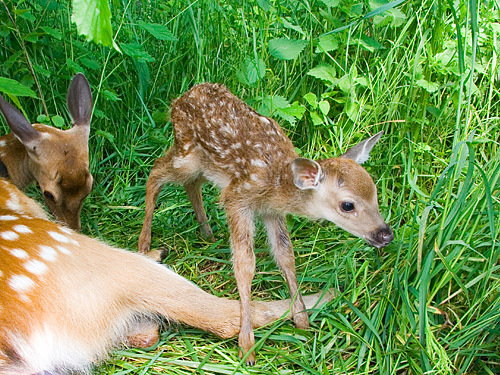 This photo is taken near a maternity enclosure. Both mothers are near their parturition ranges, both obey the necessity to defend them. 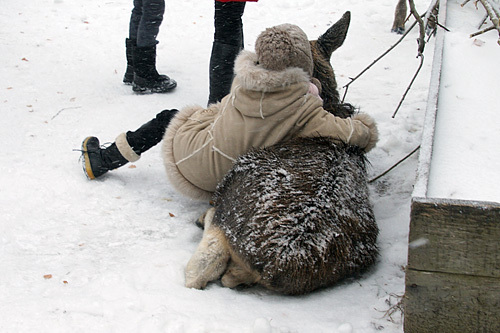 Next moment moose may rise on her hind legs and strike an enemy with front hooves flat-wise. The second photo is taken by me under a threat. I was walking across an open field and couldn't find a tree to climb (or run around from the moose). I noticed a threat, took several photographs and retreated slowly along a straight line left at an angle of 90° to a moose nose direction. I gave her the road, that's all. At the same time I took off my rucksack as a last reserve. A last chance gives a rucksack or a jacket, flail against the moose hooves, trying to raise rucksack as high as possible. 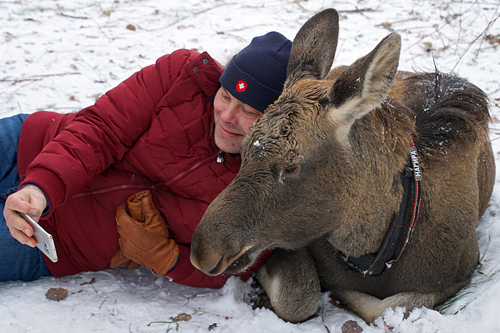 Never try to run away from this position, because a moose is faster than a human. Never approach if you see ears down, a moose is ready to strike in self-defense. 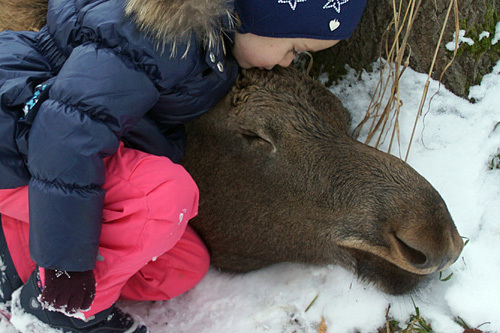 The most dangerous is to fall on the ground; an excited moose will try to kill «a small moving animal». Tuck if possible and don't move if you are blown down. 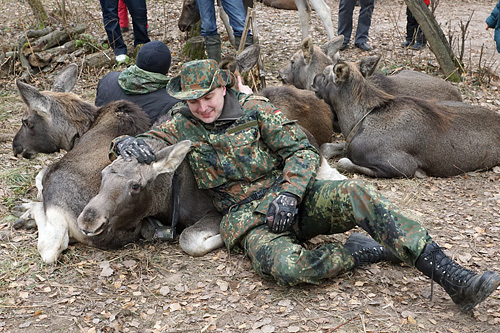 Rucksack will not help you against a male during the rut period; he will rather find you teasing and toss or hole you. Once in September a garden owner in Sumarokovo took a chainsaw and fantasized himself into a hero. 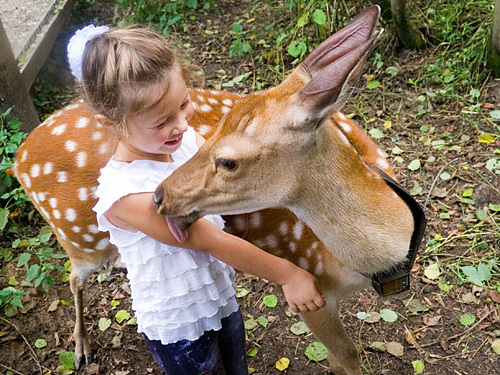 He wanted either to shoo the 8 years old Yaston away from his garden or to sever his antlers from his head... We'll never learn what he wanted to do. Also, it is hardly useful to give him the road, because during the rut period he is looking for somebody to fight, and your size fits a target. Thus, in an open field, you should squat down, tack, «become small». A small object is undeserving an antler blow. The risk of hoof blow remains, but in the rut he doesn't pay attention to «little things». Avoid open fields during the rut period! An unknown odor can cause it, but moose are acquainted, perhaps, to the best of French perfume. But who knows, maybe your perfume will excite this moose? A dog scent doesn't cause an aggression, as a rule, because many of farm workers have dogs. But they don't take them going to the farm to work. Visitors are not allowed to take pets to the excursion. Some poses can cause an aggression. Crawling or walking on hands and knees almost certainly causes an aggression. You become slightly similar to a wolf. Don't pick up a carrot under moose belly. Don't leave your children alone, they can cause a defense reaction against a small moving object, too. Hold their hands till the end of the excursion! Children have an aptness to get in gaps. The bar terrace was separated from exhibitional enclosure with a double fence. A little boy scratched his leg between the fences. 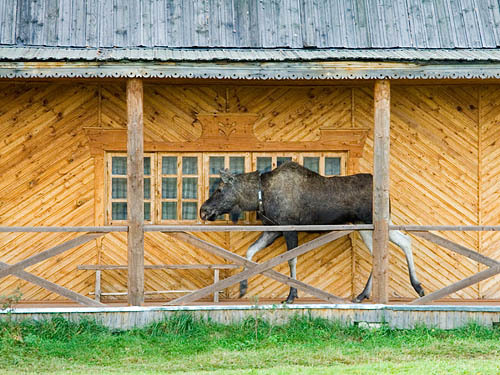 No moose is guilty: a boy impaled himself on an iron nail of electric equipment protective grounding. Your fear can cause an aggression. In the nature a frightened means an enemy. Behave calm or at least imitate calmness, don't exhibit your fear to an animal. In 1970-s moose were much more dangerous than now. 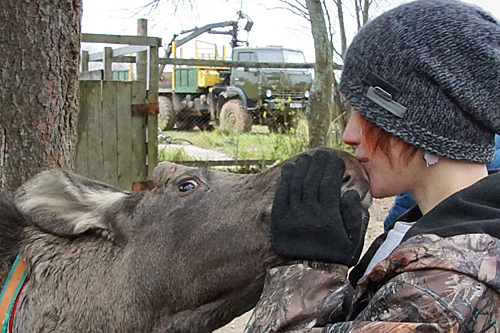 In my very first day on the farm I met Mirka, an adult moose cow. I scratched her neck, fed her with bread, pat her and couldn't imagine that she can be dangerous. 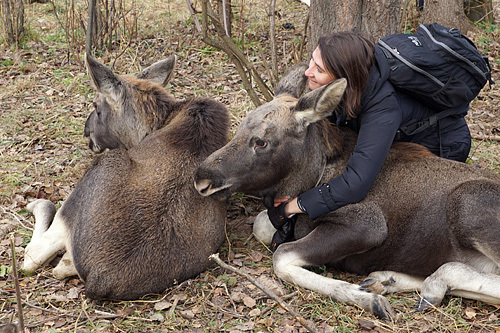 Some days later a worker told me that Mirka is the most aggressive moose on the farm, and local villagers look for a tree seeing her. Next day I exposed my fear and immediately received a blow. 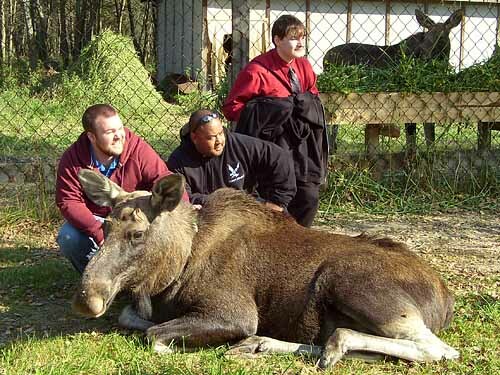 By examples of Mirka, Jamaica and Elesya the farm workers learnt how not to train moose. 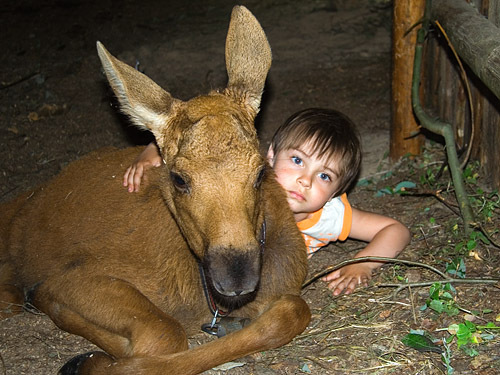 Now moose are no more dangerous than other domestic species like horses and cows. Take precautions as if you are near a horse or on a cattle farm. Do not flourish your hands: raising hands can be regarded as an attack, though now moose are acquainted with this, too. Rising hands is sometimes the last chance to stop moose attack, but if moose is in good spirits, your bad behavior may disappoint him. Do not shriek. This rule was very important 10 years ago, moose cows lost milk yield and a loudly speaking person was under a threat of a hoof blow. 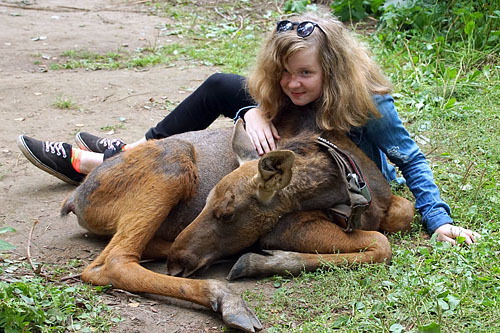 Now it has almost lost its meaning, moose are very well acquainted even to children squall because sometimes children screams mean a chance to get something tasty, like a bell for a Pavlov's dog. 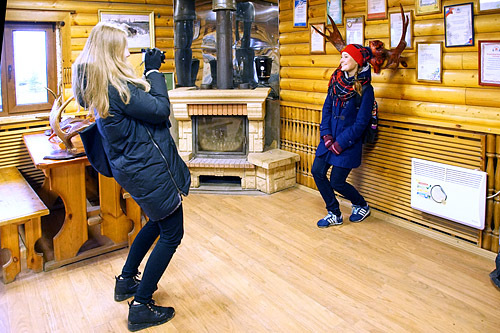 A music from a loudspeaker means nothing for moose, but disturbs other tourists. Never speak to a dairywoman in the presence of a moose cow. This really may be dangerous. Joking aside, I mean it. 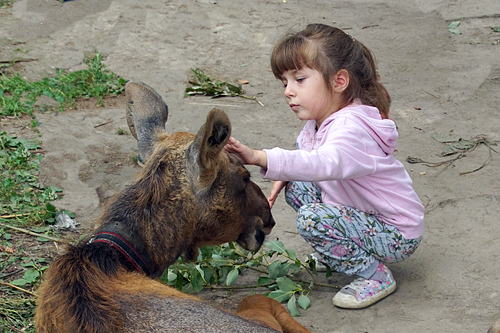 Moose cow treats a dairywoman as her own child. Never chase a moose who doesn't want to talk to you and goes away. If he retreats with a whimper, he only doesn't like you. If he retreats mutely and turns ears down, he is ready to a fightback. Watch out! 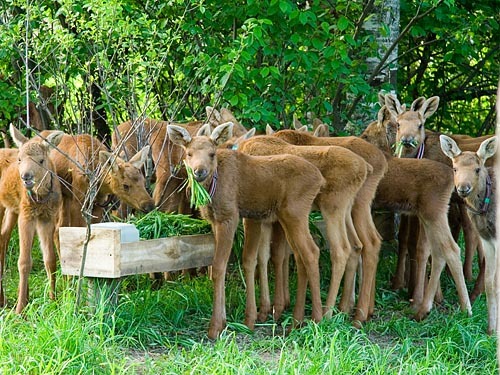 In autumn moose calves mass grows up to 100 kg, and, in theory, they can damage human. I think that's enough for visitors. 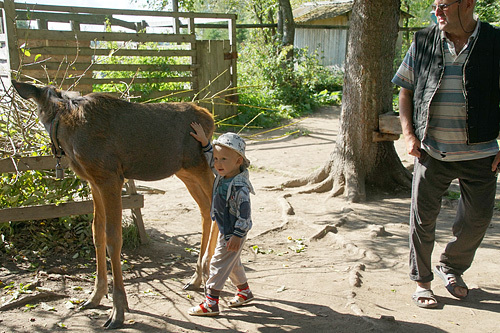 Farm workers or visitors, who stay on the farm for more detailed contact to the animals should read a brochure about safe work which is present in the Library (sorry, only in Russian). I ask «partisans» to read the brochure, too. In the nature reserves «a partisan» means a person who trespasses the reserve (zapovednik) border with no intent to gain any profit. Partisans never cause damage to the nature. «Photo-poachers» who break nests for the sake of a commercial photograph are not partisans. Please take into account: The encephalitis is a common disease in the majority of Russian regions. The excursion trails are usually sprayed with insecticides, thus the danger is not very high. Beware of ixoda ticks, inspect your clothes, pay attention to insects creeping on your skin. Don't rush into bushes. Walking along roads and standard tour trails is almost safe. An encephalitis vaccination is necessary for work on the farm in spring, summer and even autumn.